Show me the funny: Whitehall, Russell, Bailey & more at Manchester Arena. Manchester Arena has just celebrated taking in its 30,000,000th customer (read more here) and has a history of bringing the biggest names in music, theatre and indeed comedy with the likes of Jerry Seinfeld, Jason Manford and loads more bringing the LOLs to the largest indoor venue in the city. 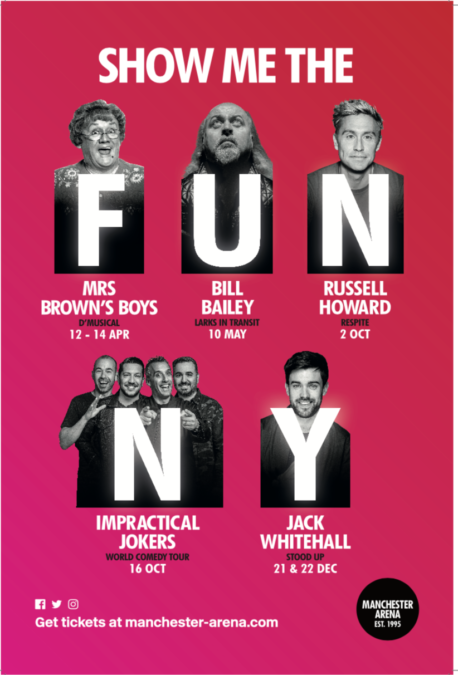 This year is no exception with Manchester Arena announcing their ‘Show Me The Funny’ season; five of the best acts from the UK and abroad including Bill Bailey, Mrs Brown’s Boys, Russell Howard and Jack Whitehall. Brendan O’Carroll’s phenomenally popular stage show and sitcom is to become a musical called ‘Mrs Brown’s Boys D’Musical’ of course. There are few awards the show hasn’t won and this looks set to be one of the hottest tickets in town with three nights to take in the Irish mammy’s dulcet tones. After 20 years as a travelling comedian, Never Mind the Buzzcock’s captain Bill Bailey has got some stories. His new show ‘Larks in Transit’ lifts the lid on some of the madcap misadventures that have befallen one of the UK’s greatest comics over the past two decades. Following the record-breaking success of his 2017 tour Round The World, Russell Howard returns with his biggest globe-spanning stand-up tour to date. As the country and the world are currently on the brink of disaster Howard brings his razor sharp wit and heartfelt empathy to try to make sense of it all. The stars of Comedy Central’s longest-running and top-rated original comedies ‘Impractical Jokers’ are coming to the Arena for a massive live performance of their usual shennanigans and pranks. Another of the UK’s biggest hitters in the comedy world, Jack Whitehall is heading out on another huge arena tour with new show ‘Stood Up’. Now with a few Hollywood films in his back pocket opposite the likes of Kiera Knightley and Dwayne ‘The Rock’ Johnson’ and some ‘Travels with my father’ done with he can get back to where he really comes to life. The stand-up stage.